Summon: Destroy an enemy creature with 2 power or less. 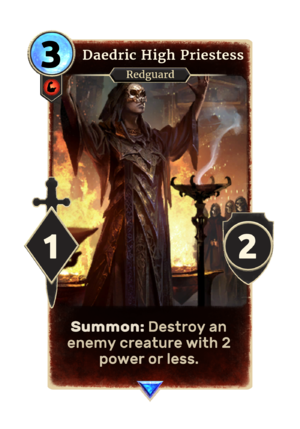 Daedric High Priestess is a rare Strength creature card. It cannot be obtained as part of your collection, but instead appears in NPC matches such as The Escape in The Forgotten Hero. "I shall devour the fools." This page was last modified on 27 February 2019, at 00:21.